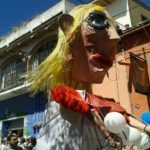 The Rebozo show takes place during the Independence Festival. The rebozo (shawl) has a long history dating back many centuries. In Spanish, ‘rebozo’ means to wrap, cover or protect oneself. Used by men as a work garment, it was once seen as a symbol of the Mexican fight for Independence as the rebels used the rebozos to rustle weapons past the guards at check-points during the 1910 Mexican Revolution. 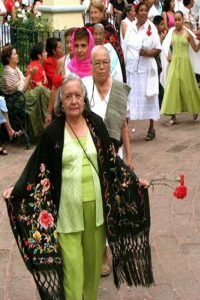 Mostly worn by women now, the rebozo is a long rectangular item of clothing that can vary in length, usually 5-6 feet long, a 9-foot version is also popular. 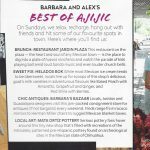 Mexican rebozos are mainly made from wool, cotton, rayon or silk and the prices vary, depending of course on the kind of fibre used, with silk being the most expensive. 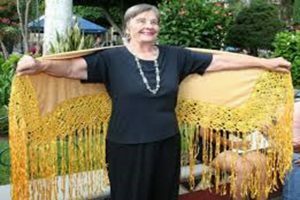 It has been said that the very finest silk rebozo “can be threaded through a wedding ring”. A winter rebozo would be of a thicker, tighter weave, usually using wool, while a lighter, looser weave using fabrics such as cotton would be for the warmer months. 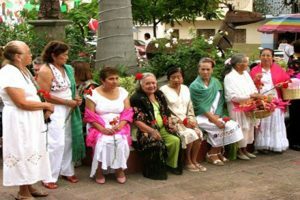 Silk rebozos are reserved for social occasions such as weddings or balls. 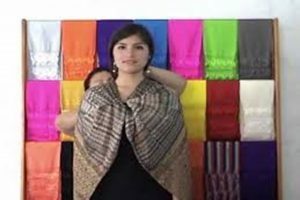 The style, patterns and colours of the rebozos can often indicate the area in which the shawl was made, some are simply patterned while others are intricate works of art. 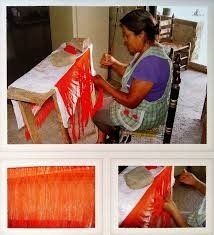 Traditional weaving of a rebozo is complex and can take thirty to sixty days to complete subject to the design chosen, the finer silk rebozos even longer. The uses of the rebozo are many and varied. 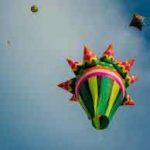 In rural Mexico, it is used to carry little ones or produce and is part of the national Mexican costume ‘la china poblana’. It may be wrapped around the head for shade, or around the body for warmth, as a skirt or in many configurations as an embellishment. 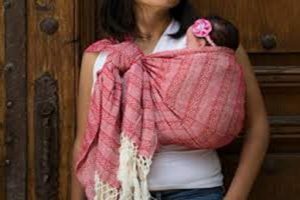 It is used for support during pregnancy and labour and for carrying baby after the birth, keeping baby close to Mom (or Dad). 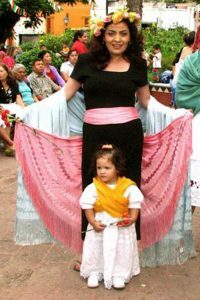 The Rebozo is truly a multi use garment for all ages, so do take in the Rebozo Fashion Show that is part of the Festival as the ladies parade their beautiful shawls with great pride – and perhaps take home your own rebozo!